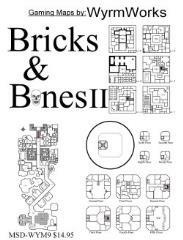 This second volume of Bricks and Bones contains a wider variety of lairs then its older brother comprising of 30 maps. The maps can be used individually or mixed and matched as the user sees fit. This map set is ideal for any game master wanting to populate his/her world with dazzling & intricate lairs and places.